Sydney is one of the world’s most vibrant and exciting cities and definitely a must! So, getting a feel for Sydney and at the same time experiencing the amazing Blue Mountains in just 3 days is going to be tough but not impossible! Here’s a great itinerary we built in Traveloris that will give you a flavour of the city while also giving you an opportunity to explore the natural beauty that surrounds Sydney. Before we dive into the itinerary, if you are simply interested in learning more about Sydney, check out our ultimate insiders article on Sydney. Start you morning by walking through the Royal Botanical Garden and making your way to Mrs Macquarie’s Chair for the best view of Sydney Harbour and city skyline. Head back through the Botanical Garden towards the Big Bus Hop On-Hop Off Tour stop #9 (Royal Botanical Garden) and grab yourself a 24 hr ticket. It’s one of the best ways to see all the main sights when you have limited time and you’ll even get a chance to experience Bondi Beach. During this tour, get off at Darling Harbour where you will find the Australian National Maritime Museum which includes a replica of Captain Cook’s Endeavor. For thrill seekers, end the day with a big bang and have a go on the Oz Jet Boat. It’s a blast! It’s a must to explore Sydney from the water which is why Day 2 starts with the Hop On-Hop Off Captain Cook Cruise. During this trip jump off at Taronga Zoo and enjoy a few hours there. For a bit of fun you could try out the Wild Ropes at the zoo. At 1:30pm join the Rocks Walking Tour which starts at Shop 4a – Clocktower Square, Argyle and Harrington Streets (only a 6 minute walk from Hop on Hop off’s stop number 2, Circular Quay). There is no better way to get up close and personal with the living history and heritage of Sydney than on foot, so this is a must! Spend the afternoon in Darling Harbour and visit the Sydney Aquarium and the Chinese Garden of Friendship. This is also a great spot to enjoy dinner. Remember that your ticket for the Hop On-Hop Off Cruise is Valid for 24 hours so this will be your way of getting around for the whole day. You need to start this day early. It’s time to get out of the City and catch a train from Central to Katoomba. 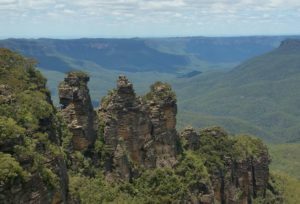 From there jump on the Blue Mountains Explorer bus and take in all the main sights that the Blue Mountains have to offer including the Three Sisters. Next up are the Jenolan Caves. There’s a bus service from Katoomba called the Blue Mountains Bus Company which will take you there. Make sure to book your tour for the Jenolan Caves in advance to avoid disappointment. There are also tours available from Sydney that will take you directly to the Blue Mountains and the Jenolan Caves. The extra convenience does come at a higher cost though. This is a great itinerary to get a feel for Sydney, and we have kept the evenings free so you can decide whether to have a night out, go dining, or have an early one. All of these attractions would cost 2 Adults about $760AUD. However, there is a great way to save some money! Most of the above attractions are either free or included in the iVenture Card. By buying the pass you would save more than $250AUD and add flexibility to your trip which is really convenient and a big bonus! 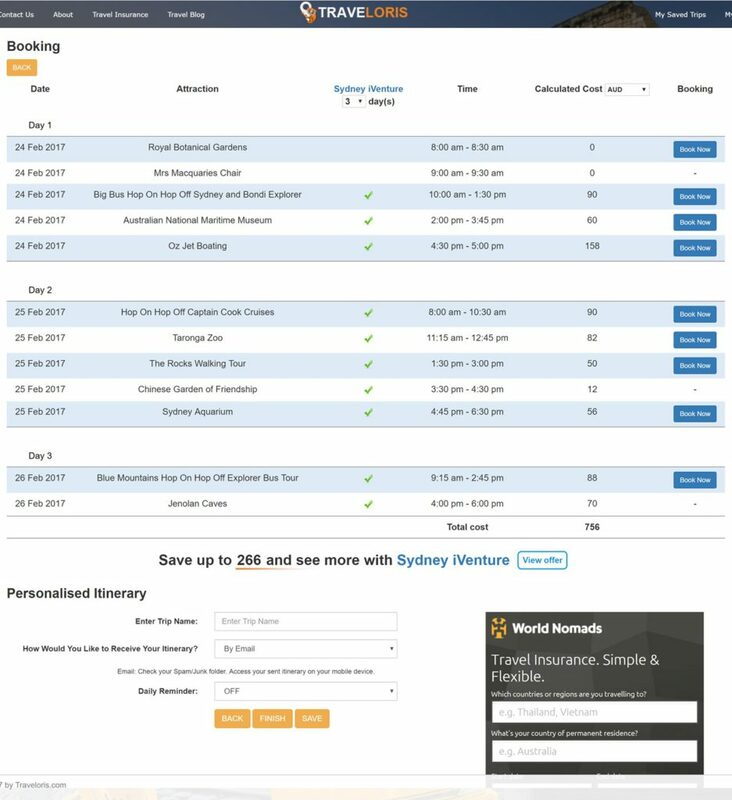 Because we built this itinerary using Traveloris you can easily replicate it from scratch, or make some changes of your own to it (you can access this exact itinerary here). Finally, when you go to the booking page we will tell you how much you could save with the iVenture Card. Easy! If you think others would like this blog, I’d really appreciate it if you shared it on your social media sites. There’s some buttons below that make sharing nice and easy.